My name is Kirk, and I’m tag-obsessed. With an iTunes library of more than 50,000 tracks, I spend a lot of time ensuring that all my tunes are tagged correctly not only so I can find them easily, but also because they just have to be tagged the right way. This can be a time-consuming task, going through parts of my library track by track, selecting a song, pressing Command-I, and changing some tags. There has to be a better way. Equinux’s SongGenie is made for people like me. It looks through your music library—whether you use iTunes to organize it or not—and checks the music, identifying tracks with no tags, offering to complete the tags of partially tagged tracks, and trying to correct errors in tags—be they spelling, capitalization, or other problems. My review of version 1.1 of SongGenie explains how the program works, and the under-the-hood elements haven’t changed much. The program still uses the same technique—acoustic fingerprinting and the AmpliFind (formerly MusicDNS) database—to identify tracks. But the program’s added more tags it can search, and also more flexible operation and an improved interface. It still takes a fair amount of time to scan a large library (this time I threw my 50,000-track iTunes library at it), and searching is processor-intensive, as it searches several tracks at a time. When SongGenie finds missing or incorrect tags, it shows you its suggestions with your choice of Red Hot Chili Peppers (red) or Tangled Up In Blue (blue) labels. Click a label to change that tag, or click Apply to apply all the tags that it shows. You can now manually edit tags, which is quicker than using iTunes, and the program can correct capitalization errors using an editable list of words you don’t want capitalized (unless they are the first words of titles). SongGenie can also identify and correct genres, and if you’re in doubt about any tracks, you can play them directly by clicking a Play button. One thing SongGenie doesn’t do, however, is help you add album art to your music files. To do that, you need to spend another $40 on the company’s CoverScout, the latest version of which integrates with SongGenie. It’s too bad that equinux forces you to buy two different applications—without a bundle discount—to clean up your tracks, especially when apps such as TuneUp Media’s TuneUp do both for less money. SongGenie showing information for a track, and the tags it's presenting to change. The biggest new feature in SongGenie is its ability to search for and add lyrics to your music. It gets lyrics from Leo’s Lyrics and LyricWiki. If it can’t find any on those sites, it offers to automatically search a number of lyrics sites on the Web using its built-in browser window. I found this a boon, because I like to have lyrics for some of my songs, especially those by The Beatles, Bob Dylan, or The Grateful Dead. To add lyrics to these tracks, I used SongGenie’s preferences to have the program just search in the folders containing music by these artists, so it wouldn’t have to scan my entire library. This is not a complicated process, but it’s hidden in the program’s preferences; a better way to scan individual folders would be useful. However, you can choose to have SongGenie search for and add lyrics to all your songs automatically; for other tags, you must either choose to apply them all, or click for each tag you want to change for each song. One hitch: it can’t find lyrics for a song that has a segue symbol in its title, such as “Dark Star >”, when you try to add lyrics automatically; you need to have the songs recognized, by acoustic fingerprinting (which takes much longer) to get lyrics for these tracks. While the program identified a lot of music, it doesn’t find every track; some tags are misspelled or have other problems (missing or superfluous “The”, incorrect use of commas in titles, and so on), and sometimes I found lyrics that displayed in all capital letters. I’d like to be able to manually change certain tags (such as an album name) for multiple tracks, and the undo feature didn’t seem to work. Several times, when making changes, SongGenie told me it couldn’t find the file it was changing, and, when I cancelled the operation, the change had been made (because the files were indeed there)—the company is aware of the issue and is investigating it. In spite of these limitations, however, it is a huge help to those who want good tags for their music. If you want to keep your music library well-organized, you need to have good, normalized tags. And if you want lyrics with your songs, this can be a long, complex process. 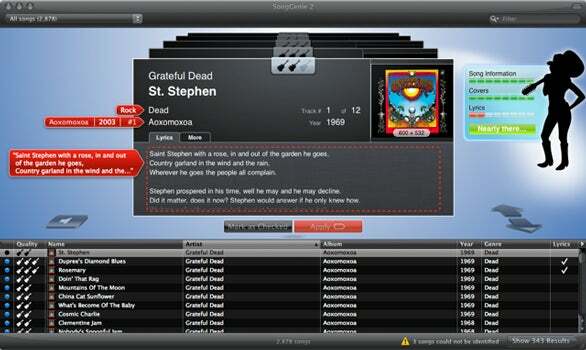 SongGenie is a great tool to help you get the right information into your music files, both tags and lyrics. It will certainly improve the tagging of the files in your iTunes music library.